How Many Of Your Prospects Ask You to Sell Them Whole Life Insurance? to Buy Whole Life Insurance. It sounds like total B.S. and it's not something I ever thought was possible back in September 2000, sitting in my miserable, tan cubicle making 100+ dials per day to set appointments with total strangers. The phone pitch is still fresh in my mind..."I just wanna come by and tell you more about the type of work I do." Still makes my palms a little sweaty. Thankfully, those days are long gone. What can you learn from selling over $6,000,000 of life insurance premium in just a few years? You learn that dealing with life insurance companies is only slightly less agonizing than a root canal without novocaine. You learn that trying the lame, tired, high-pressure sales tactics perfected by a washing machine salesman in the 70s and 80s ruins your chances of being taken seriously. You learn that despite all the hurdles, all the underwriting obstacles, and bad financial press, your clients like what whole life insurance can do for them. Over the past few years we’ve talked to hundreds of whole life insurance prospects. This includes people looking to warehouse cash for liquidity, to create future retirement income, to fill a role as a stable asset in their portfolio and more. The data gathered from all those conversations and answering thousands of questions has allowed us to charge for consulting and to give our clients better results. And we’re still talking to prospects and clients most days of the week, constantly refining our understanding of what they really want. You Sell Whole Life Insurance! Hey there, my name is Brantley Whitley. I’ve been a life insurance agent for over 18 years. The first twelve years were miserable, I failed at selling whole life insurance in just about every way possible. Pretty sure I pioneered new ways to fail, not that I'm bragging. Six years ago I stumbled upon an idea that changed it all for me and it can work for you too. I’ll share that story with you a little bit later. The truth is, of all the things I’ve tried to get prospects interested, the five-point solution revealed in the guide I’m here to share with you, is the only one that’s ever worked consistently for me. It was put together with my business partner, Brandon Roberts. He’s been in the life insurance business for over 10 years and he formed the backbone of this material. I’m sharing our process with you. I’ll show you how we’ve used this easy-to-understand and simple-to-integrate information to build a successful life insurance practice. In fact, it works so well that our two-man life insurance practice has placed over $6 million in whole life insurance premium over the last five years. I understand your doubt. Nobody’s more skeptical than me. Before I lose you...you need to know something about us. We’re not special, we just found the keys to unlock your prospects hidden motivations that make them want whole life insurance. I know what it’s like to spend thousands of dollars (that you really don’t have) and waste countless hours learning about the latest way to pack rooms for retirement seminars or the latest 8-step plan to “find the money” for whole life insurance. Only to have a packed-house of 5 seminar attendees after mailing thousands of invitations. Or worse, prospects giving up after you tell them you need to schedule their 3rd meeting. Unfortunately, that’s only the poisoned tip of the disappointment spear. The real pain sets in when the uppercut of reality smashes you below-the-belt. You have to start over tomorrow. As one of my colleagues put it to me nearly 20 years ago, “...you're just a rat on a wheel”. And worse than that, you’re not really sure what to do next. Back in 2008, with the United States in the throes of the financial crisis, something finally clicked for me. Now, before you start thinking I’m all enlightened, I’ll confess to you that as far as I can tell it came as a stroke of luck or divine providence. I’m not really sure about all that “woo-woo” stuff but my discovery came as a result of a chance conversation. I met a guy, let’s call him Tom, at a summer cookout. Tom was in his early 70s and a wealthy guy. He owned a few mid-sized manufacturing operations on the east coast and in the midwest. His businesses were profitable and he’d been diligent to take profits off the table. So, he was able to put a nice chunk of money into other investments and savings--apartment complexes, self-storage facilities, timber and of course buying plain old common stock. But in his opinion (when I asked) there was only one place he’d put money that had exceeded his expectations…whole life insurance. I knew about whole life insurance, I owned it, and had tried to sell it early in my career. Heck, my first job in the financial services industry was with a company that specialized in selling whole life insurance. That was the lightbulb moment for me. I went home after that conversation and started looking for the pieces of the puzzle. Do clients like Tom need life insurance for estate planning? Yes. Should life insurance be a part of succession plans for their businesses? Absolutely. Could whole life insurance help them solve these problems? Of course. Tom never talked about any of those things in our conversation. Any idea why he didn't mention any of these things our industry tells us are so important? Because none of those things do anything for him. Solving estate and business succession problems helps other people. But Tom isn't interested in solving problems for everybody else. You can’t lead with what whole life insurance does for everyone else when Tom dies. You will repel the wrong prospects in a nice way so that you can stop wasting the thing that you can’t produce more of--time. You will have a straightforward way to communicate the value of whole life to them NOW - no need for them to die - this raises your value immeasurably in the mind of your client. What you’ll know after studying the manual will put you miles ahead of what any expert (who’s never actually sold a whole life insurance policy) could teach you. There’s no shortage of sales training programs out there - that’s not what I’m offering you. After reading about Tom and why our approach is so much better, you probably figured out that our guide is not teaching you to become a better salesperson. The goal of our book is to help you become a competent resource that can actually help your clients. Increasing the sales revenue of your practice is just one of the incredible side effects. You can take responsibility for your own success. You can free yourself from the shackles of the “always be closing” mentality, complicated multi-meeting presentations (that put your prospects to sleep) and prospects who can’t afford the solutions you offer. Over the past 18 years, I’ve talked to tens of thousands of prospects. I’ve delivered thousands of proposals. But over the last six years, after making this shift, I’ve made more money than I did in the previous twelve years combined. This exclusive information has already been used to place millions in whole life insurance premium over the last 6 years. Now you can have access to the most influential components of how to best use whole life insurance. We have distilled it into an easy-to-read and understand guide that we call “Predictable Profits”. The information is gathered from experience in talking to tens of thousands of prospects and delivering thousands of proposals in the last 18 years. Over 96% of that was done with clients we’ve never met in person. ALL of this premium was paid by clients who knew we sold whole life insurance and they wanted to buy it which makes selling easy. You'll get over 40 pages of proven, verified, tested in-the-trenches information that you will not find anywhere else and that we use in our practice every day. This program has absolutely no fluff or filler content, it’s all straight-to-the-point with case studies included to help you understand how you can apply it with your prospects. Listen...you don’t deserve the poor training the life insurance industry has given you. Please, stop believing the lie that you just need to be better at sales. You’re not going to forget to close sales. But with Predictable Profits, you can stop trying to figure out what really motivates your prospects to buy whole life insurance, so you don’t have to keep chasing your tail. If you know what really motivates people, you've already won half the battle. And money on expensive multi-day "gooroo" training seminars and complicated software packages. Those things only make you feel like you’re doing something without actually giving you any real solutions. They rarely help you sell even one extra policy. Because even though you might find an interesting tactic to get excited about, your practice still has a fundamental problem. You still don’t have a true understanding of how to communicate the benefits of whole life insurance in a way the clients actually care about. You’ve gotta be able to scratch the “what’s in it for them” itch and that’s what we teach you. The longer you go without fully understanding this, the more opportunities will keep passing you by. It’s time for you to stop that and take action to move forward. This guide is unique in our industry and easy to consume. In fact, it will become a reference guide for you to come back to over and over again. It’s tough to put an actual dollar value on this information. Cost me 12 years of trying just about everything and failing repeatedly. The last 6 years, after applying this information, have been way better. Cost me hours of study, research, frustrating “trial and error”. After releasing the book to be evaluated by other industry experts and a few of our own clients, we were told that the no-nonsense information we provide is more valuable than complete systems that cost $1,000’s. And we should charge at least $1,000 for it. Considering that we normally charge $250 for an hour of private consulting, that price seems fair. Then we shared what we plan to give away as a free gift to the people that take us up on the early-bird offer and they couldn’t believe it. The bonus material alone is worth a small fortune. We know this information has the power to save agents thousands in wasted training and sales systems. In turn, it will improve the financial well-being of thousands of people. But our number one goal is to change the public perception and misconceptions about whole life insurance. The only way to do that is to get this into the hands of as many professional agents as possible. That's why decided to charge so little for it. Once you enter your information, you’ll have instant access to download your copy of Predictable Profits onto your computer and print it for easy reading or reference. There is no need to wait for anything to be shipped to you. Though we are gonna ship you a paperback version as well. And as I mentioned a little bit earlier, for a limited time, we have a special gift for you. I know you’ve been wanting to sell more whole life insurance for a while, that means you need to understand the best products available in the market right now. So, I am also including our “2018 Best WL Policies for Retirement Income” comparison guide at no extra cost to you. There is no other way to get this information from us. It is being offered only as a bonus for taking us up on this offer. The last time we released something like this it was read by thousands. That was about 3 years ago and it was one of the most popular things we’ve ever published. But this time it will only be available as a bonus for your purchase of Predictable Profits. It’s great to understand what and why whole life works but it’s even better to tie it down with the “how” you do it from one product to another from one company to another. This handy little bonus guide will help you take the concepts provided in Predictable Profits and apply them to the shortlist of companies and products you should use for your clients. You need to have the clearest path possible to better position and sell more whole life insurance. That’s why it’s important that the information in this bonus guide be included with your book today. Today, when you grab Predictable Profits, I am including the “2018 Guide to the Best WL Policies for Retirement Income” for no additional cost. As I mentioned earlier, you will be getting over 50 pages of field-tested tactical information in Predictable Profits that you can use right away. It will help you better position whole life insurance as a comprehensive solution. That includes five different ways to communicate the value of a whole life policy without ever needing to sell the death benefit. Imagine a life insurance sale where the death benefit is almost incidental in the mind of your client! 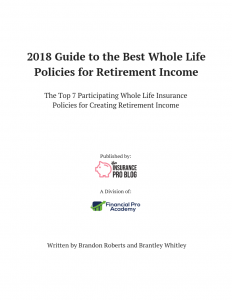 For a limited time, I’m giving you the “2018 Best WL Policies for Retirement Income” guide absolutely free. This will give you the best chance at connecting all the dots of whole life insurance for the best possible outcome. If I were to teach you ALL of this information one-on-one it would cost you over a thousand dollars (considering I charge $250/hr for private consulting). Not to mention the tens of thousands of dollars I’ve already spent figuring out what works and what doesn’t. What people want and what they couldn’t care less about. All the lessons I learned from spending money on guru courses, seminars, marketing systems and software that didn’t help me sell even one more whole life insurance policy. I spent almost twelve years trying to convince people of their need to purchase whole life. ...and those are just the things I can remember off the top of my head. But it wasn’t until I mastered the secrets revealed in Predictable Profits that I learned the power of giving people what they want first. Turns out if you give people what they want, they will buy what they need. My failures in finding effective ways to sell whole life insurance and communicate it’s value can save you thousands of dollars. And making a small investment in Predictable Profits could earn you hundreds of thousands of dollars over the next few years. A lot of people would sell you a super-deluxe course with tons of videos, weekly coaching calls, and an ongoing membership cost to update it all in real-time. And they’d ask you to pay a couple thousand dollars for it. However, I wanted to give you something that you could keep at your fingertips. Something you could know inside and out. So, I decided to package it as a cut-to-the-chase sort of manual. Instead of charging $20 like a book at the bookstore that’s filled with 90% fluff, I’m asking you to pay a fair price for just the stuff that we know works. Today, you get Predictable Profits plus the FREE Bonus “2018 Best WL Policies for Retirement Income ” and we're also going to include over 90-minutes of audio commentary covering each part of Predictable Profits. You can listen on your computer or download the MP3s to your phone for listening in your car, at the gym, or whenever you like. Live Case Study Video Recording: There's an ongoing debate in the life insurance industry...Direct recognition versus Non-direct recognition. Which is better? Believe it or not, it's something that other agents ask us about all the time. This recording is split into two parts. The first part has more than 30 minutes explaining the difference between direct and non-direct recognition with actual illustrations included, what's real and what's just smoke and mirrors. The last part of the recording is dedicated to answering questions that were submitted by people attending the event. Those who've watched this, have raved over the value provided. Yes, you read that correctly, you get all of this for a one-time secure payment of only $99. That’s right, we’re asking you to pay less than 50% of our hourly rate for private consulting. Remember, you’re getting more specific information than we could ever deliver in an hour of consulting. In fact, more actionable information than we could give you in a few hours. As you can tell from the low price, this isn’t my “get-rich-by-selling-you-dreams” plan. We still sell whole life insurance to clients everyday. This is our way to help out the good people who get jammed up by the bad training and information in our industry. Too many agents can’t keep their head above water and that’s unfortunate. Your clients need you to be successful. Predictable Profits and the bonuses will give you a shortcut to make that possible. We’ve distilled over 20 combined years of what works to sell more whole life insurance into less than 100 pages. We’re giving you the ultimate shortcut. Mastering these concepts has changed my family’s life and given me the opportunity to work with great clients that WANT to buy whole life insurance and are profitable relationships for our practice. So I feel honored to be able to share this information with you. And that’s why we priced this as low as we possibly can while still managing to keep the lights on. Money Back Guarantee: We know that you'll love our products because our customers write in telling us that all the time. But, just in case, we have a 30 day money back guarantee. Just send an email to our support within 30 days of purchase, and your entire purchase price will be refunded right away. We reply to all such emails within 24 hours Monday-Friday. Customer Support Guarantee: If you send an email to our support, we will respond within 24 hours. We are devoted to supporting each and every one of our customers. When you buy from The Insurance Pro Blog, your purchase comes with premium level support. Any messages that you send or questions you have will be answered within 24 hours (except for holidays and weekends). 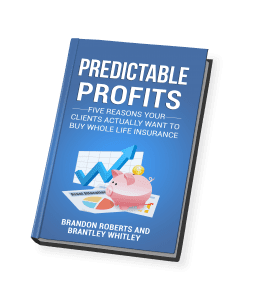 If you buy Predictable Profits (and get the bonuses for free, including the live case study recording), then decide to go back to selling life insurance as a death benefit first product trying to solve problems that don’t motivate your prospects and trying to squeeze as much commission as possible out of every opportunity that’s your option. ...just shoot us an email (it’s printed in the book) and we’ll refund your purchase. I’m sure you won’t because this information is truly life changing. It’s the same information that changed my business and my family’s life. Please keep in mind that you must act soon to claim the best possible price for Predictable Profits plus your valuable “2018 WL retirement income” guide. When this offer closes, it’s unlikely you’ll ever see anything like it again. The information shared in this book and the bonus guide are not available anywhere else. We have packaged over two decades worth of experience in the field actually talking to clients about the value of whole life. You can’t learn this from a seminar or a textbook. Right now, you have the chance to be among the first people in the country to see how we put the pieces of the puzzle together that successfully sells whole life insurance to people who WANT to buy it. Don’t wait! You still have the first mover advantage. "I read every one of your blended whole life articles and learned A LOT from them. I truly wish I would have had an agent like you when I purchased my whole life insurance a couple of years ago. Very upset my agent never shared with me this blending option…"
"Thank you for your insightful blog. I'm a young independent agent with experience at two of the big captives before striking out on my own. I really appreciate your valuable information about the best companies for whole life cash value accumulation." "I like what your selling here, cold hard facts , and the truth. I am looking to set up a whole life policy, and thus far have not gotten anywhere near the truth from two different insurance agents and their illustrations...I've learned a lot just from your blog alone!" Over 90-minutes of exclusive audio commentary where we dive into each part of Predictable Profits. Our Live Case Study Video Recording with Q&A Session-The first part has more than 30 minutes explaining the difference between direct and non-direct recognition with actual illustrations included, what's real and what's just smoke and mirrors. The second part of the recording is dedicated to answering questions that were submitted by people attending the event. Those who've watched this, have raved over the value provided. That’s over $2,500 worth of information that you can’t buy anywhere else for the introductory low price of $99. Look, you know that this sort of information has the potential to change your trajectory. How many new clients could you bring into your practice if you knew how to communicate what people actually wanted? How much extra revenue could you add to your bottom line if you just sold an average whole life insurance policy every month? In our experience, you’d probably add about $84,000 in a year if you only sold one per month. Imagine selling two or three per month if you want to work at it. What kind of impact would that have on your life? Your instincts are right, there’s more to whole life insurance than you’ve been taught so far. Once you master the principles included in Predictable Profits you’ll never look back or have to spend time overcoming silly objections. Nowadays, I head upstairs to my office when I want to, talk on the phone to prospects who contacted me and who want to buy whole life insurance. I only go out to meet someone if I want to. Understanding how to effectively communicate the value of whole life insurance and its cash value benefits has changed my career. It’s afforded me the chance to live a life that so many struggling agents dream of living. P.S. If you’ve read this far and haven’t decided to buy, you’re probably looking for me to give you a bit more...I understand. The digital version of Predictable Profits available for you to download immediately. You'll also get the paperback version of the book shipped out to you within one business day. Over 90-minutes of audio commentary where we shed some light on each part of Predictable Profits. You could be in the same place you are today, fighting the same battle--frustrated from being rejected over and over. Your list of “should have saids” growing longer every day and you won’t be any closer to selling more whole life insurance. I want you to finally get the breakthrough you need to position whole life insurance as the problem-solving tool that it actually is. And I want to see you knock out the obstacles that are keeping you from doing that. Predictable Profits will help you do that. There’s no reason NOT to try it today, you have nothing to lose. So click order now and get started today.